Innovation in the eyes of Van-Am is accomplished through the effective application and utilization of all of Van-Am’s skilled employees and equipment to provide real solutions and value to our customers. No matter the project, we approach it from the innovative stand point of how can we utilize our resources to help the customer achieve their desired results. 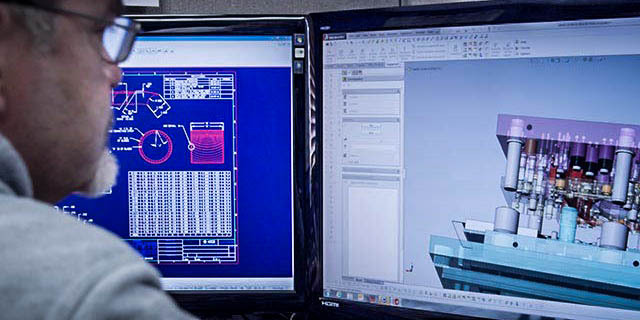 This means we may reverse engineer an existing component part, produce drawings from the customers’ sketches or concepts, or provide input or actually design a product for the customer. We then use all of our skilled employees and equipment to cost effectively produce the desired product; which can be a metal stamping die, a one-off or production quantity machined part, low or production volume metal fabrications, production volume metal stamping, or turn-key manufactured products. Van-Am not only brings exceptional value to our customers by providing innovative manufacturing solutions and high quality services, but we also bring value through our continuous improvement and quality commitment. This quality is not only apparent through our products and services, but is recognized the world over through our achievement of ISO 9001:2008 certification. Van-Am is driven to meet our customers’ technical specifications and quality performance expectations day after day.